The city of Faro is the gateway to the stunning Algarve district of southern Portugal. Chartering a private jet to Faro and enjoy the stunning beaches that stretch endlessly in front of the crystal clear waters, reflecting the sunlight that streams down on the turquoise blue ocean. Not only does Faro provide the perfect place to lounge and soak up the rays, it also harbours a wonderful antiquity that is a must see for any visitor! First and foremost, you should make time to head to Cidade Velha, or Faro Old Town. A labyrinth of calm, cobbled streets and squares, Cidade Velha is encapsulated in medieval walls. There have been a number of reconstructions to this wonderful place over the years, and there is an eclectic mix of exciting and interesting architecture to behold. The neoclassical Arco de Vila will greet you as you enter. Moving on you will discover The Faro Cathedral. This particular building has elements of the original Romanesque-Gothic exterior, however, due to rebuilding it also homes Gothic, Renaissance and Baroque styles. A truly magical sight to behold, both the exterior and interior are gorgeously intricate. Faro’s Old Town is also home to many other sights, such as the petite 15th-century town gate, Arco da Porta Nova, which leads to the ferry pier. Situated just next to the cathedral is the Museu Municipal, formerly known as Museu Arqueológico, it is housed in the grand 16th-century Convento de Nossa Senhora da Assunção. Meander out of the old town through the medieval Arco De Repouso, or the Gate of the Rest, and explore further some of the most aged sections of the town. Just outside the bustling city of Faro lies the magnificent Ilhas Desertas, a welcome respite from the hubbub. Cruise through the azure sea and after a short, relaxing ferry across from Porta Nova Pier, you will arrive at the sublime Ilhas Desertas. Known as the Deserted Island, this uninhabited, picturesque island gives off a distinctly calming ambience. As the waves lap eagerly at the shore and the rolling white sands loosen underfoot, allow the relaxation of the Algarve’s beauty to wash over you. If you hanker after some richly flavoured, authentic Portuguese cuisine, head towards Palhacinho, where it is said that everyone and anyone visits for a tasty treat. Not, perhaps, the most luxurious place, yet it will give you a taste of the traditional. In a pleasing, light and airy environment, you will receive a hearty Portuguese meal that doesn’t break the bank, and leaves you feeling full! More exclusivity is on offer elsewhere, if that so takes your fancy for the evening. Faz Gostos is located near to Faro’s cathedral and is a family-run restaurant. Serving some truly delicious food, your taste buds will ignite as you gorge on the traditional and flavoursome Portuguese cuisine. As well an exciting food list, it also provides you with an interesting and diverse wine list. Faz Gostos has become quite an exceptional place to visit, as the menu constantly changes, people are eager to return. An array of friendly waiting staff will smilingly present you with dishes such as flambéed shrimp (prepared at the table) and foie gras with pears in red wine. 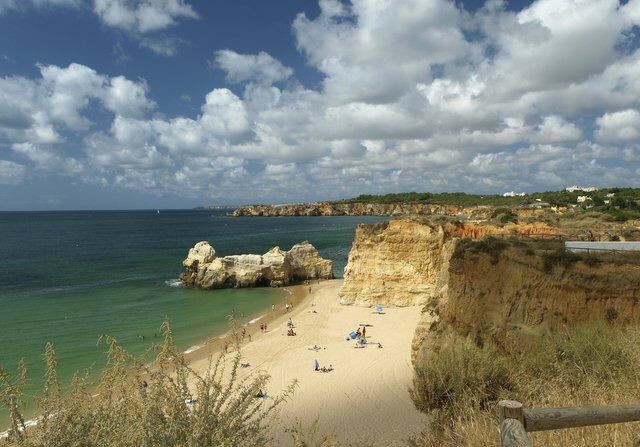 The Algarve is known amongst the celebrities as a place to go, and many famous people are attracted to it and frequent it as a holiday destination. There is a chance you may spot some familiar faces, from José Mourinho to Prince William, due to the beautiful appeal of what Faro and the Algarve offers.